This is such a lovely way to make olives just a little more special. Perfect for giving as a gift or serving with drinks, they are lightly spiced and intensely moreish. 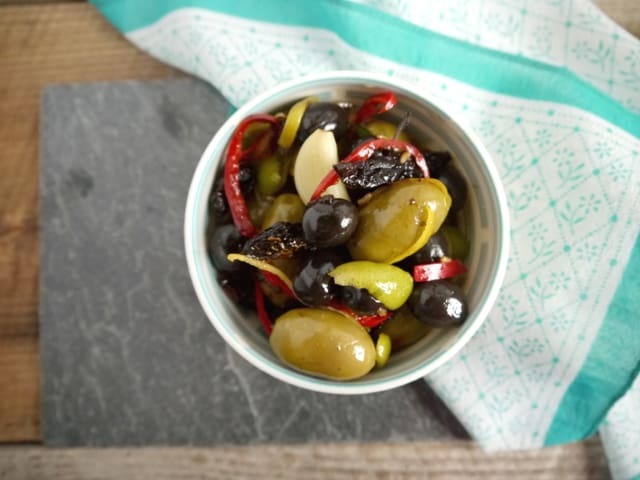 I used whole olives with the stones still intact – if you do the same, you’ll need to slash each olive first so that the flavours can permeate under the skin. If you are using stoned olives you don’t need to bother (although do note that the flavour will be a lot more intense in stoned ones). If you’re like to give them as a gift, sterilise a glass jar by running through the dishwasher on a hot wash, or boiling in a pan of water for a couple of minutes. Let dry in the dishwasher or let air dry on a sterilised draining board before potting up the olives, topping with a cellophane jam cover or a sterilised lid. And finally, if you are using dried tomatoes from a bag or your dehydrator, plump them up in a mug of boiling water for 10 minutes before gently squeezing out the water and adding in. If you buy the tomatoes in oil, you don’t need to bother as they are already soft, yummy & ready to eat. 2 jars of different olives. I used a large queen green and a smaller black olive but use a mix of your favourites. Slash each olive if necessary and tip into a clean bowl. Pile all the other ingredients on top and stir so that all of the flavours combine. Cover with a tea towel and leave to marinade over night in a warmish room. Bottle up, seal and store in a fridge until you are ready to gift them, or keep in the fridge in a covered bowl if you are keeping them all to yourself. PS don't worry of the oil solidifies in the fridge, just take out of the fridge an hour or two before you want to eat. These look very delicious and tasty. They make perfect nibbles. You make them look so appealing Janie, but I just can’t get a liking for them at all. Sigh! Does it mean I can have Jac portion if she doesn’t want them? :D I love olives!